A parasitic fungus that grows wild throughout the Himalayas and sells for more than its weight in gold could vanish if current harvesting and climate trends continue, according to new research from Stanford University. The fungus, Ophiocordyceps sinensis, survives by preying on ghost moth caterpillars in some of the highest reaches of the Himalayas. The fungus infects and eats the insides of a caterpillar that burrows underground for winter. What the parasite does next may be too gruesome to mention over a supposedly healing bowl of aphrodisiac soup (price: $688) made in Las Vegas with a mere quarter-ounce of the stuff. "It kills them and then sprouts out of their heads, like a unicorn horn," said lead author Kelly Hopping, an ecologist who conducted the research as a postdoctoral scholar at Stanford's School of Earth, Energy & Environmental Sciences (Stanford Earth). Beginning in the 1990s, demand for the fungus as an aphrodisiac, impotence cure and remedy for the deadly SARS virus – while unsupported by scientific evidence – helped to jumpstart a global trade. Since then, belief in a wide range of healthful effects from the fungus has fueled a market valued at some $11 billion, as well as concern that harvesting rates have become unsustainable. Official harvest records are unreliable, however, because much of the caterpillar fungus trade goes through illegal channels. This new study, published in the peer-reviewed Proceedings of the National Academy of Sciences, presents the most comprehensive data to date addressing whether and why caterpillar fungus production might be on the decline, and the likely consequences of a possible crash on the communities that depend on the fungus for their livelihood. Hopping and study co-author Eric Lambin, a Stanford professor of Earth system science, became interested in the fungus as a way to understand what happens when a niche biological product gives wealthy consumers outsized influence over rural livelihoods, land-use choices and ecosystems in producer regions. Research on ecosystem degradation tends to focus on the expansion of globally traded agricultural commodities such as oil palm, soy, cattle and timber – the biggest drivers for deforestation. The ripple effects of commodities that grow and trade on a smaller scale are less understood – but potentially profound, Lambin said. He points to rhinoceros horn as an example. "An emblematic mammal species is being brought to extinction due to the demand for a product which is viewed in some traditional cultures as having virtues," Lambin said. Caterpillar fungus may lack the charisma of a rhinoceros, but as one of the world's most expensive biological commodities, it has become a primary source of income for hundreds of thousands of collectors. And at a time when up to one-third of the world's parasite species could go extinct within a few decades – potentially opening new niches for other, invasive parasites to exploit – conservation biologists increasingly see a need to protect parasites as well as their hosts. According to Lambin, who is also a senior fellow at the Stanford Woods Institute for the Environment, there's no question intensive harvesting takes a toll on both people and the environment across an increasingly vulnerable landscape. While many local collectors try to minimize impacts, he said, large influxes of people drawn to the Himalayan rangelands during the peak harvest season can end up degrading ecosystems by disturbing fragile soils, cutting swaths of shrubs and trees for fuel and leaving trash around their harvesting camps. 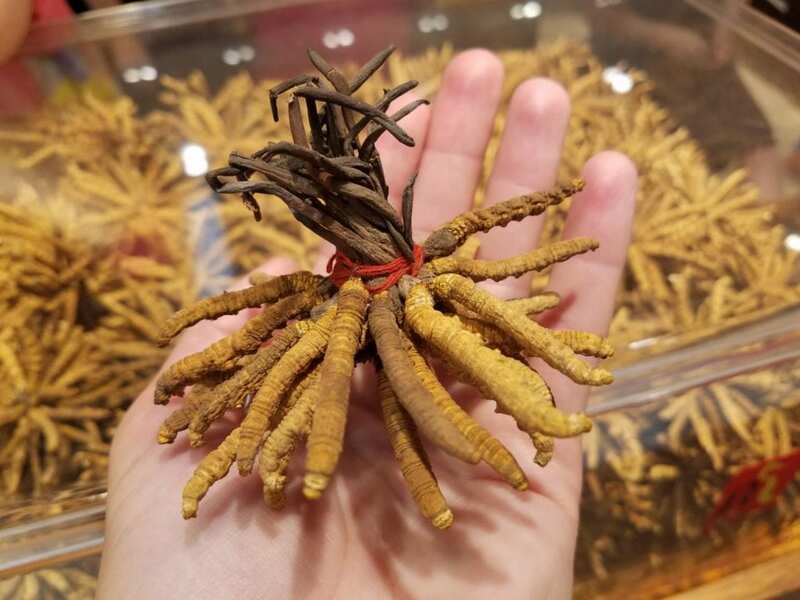 Widely known in Tibet as yartsa gunbu, or "summer grass, winter worm," caterpillar fungus has been used in traditional medicine throughout the Himalayan region and in China for centuries to treat ailments ranging from cancer and kidney disease to inflammation and aging. In more recent years it has earned the nicknames "Himalayan Viagra" and "Himalayan gold." To get around the problem of patchy trade data for the valuable fungus, the team turned to collectors' own knowledge of production trends in China, Bhutan, Nepal and India, as reported in dozens of case studies. The researchers then bolstered the published accounts by interviewing 49 collectors across the Tibetan Plateau. With this data and 400 records of where the fungus has been found throughout the four countries since the 1970s, the group built models predicting how much fungus would grow in a given area based on factors like climate and elevation. The results show the fungus tends to be more prolific in higher, colder areas around the margins of areas underlain by permafrost. Currently, caterpillar fungus is sufficiently abundant in springtime in prime production areas that many people can collect enough in a month or two to support themselves for the rest of the year. However, production is already on the decline due to intensive harvesting – and warming winters may be exacerbating that trend. In a region where average winter temperatures in some places have already increased by as much as 4 degrees Celsius since 1979 – "an enormous amount of warming," Lambin said – the researchers found that every degree of winter warming makes it makes it harder for the fungus to thrive. As permafrost disappears from lower elevations, the fungus can adapt by shifting to colder upslope habitats only if its caterpillar hosts – and the vegetation and seasonal patterns on which they depend – shift upward, too. In the long term, if income from caterpillar fungus can be sustained, the study suggests, it could provide an important financial cushion for those whose livelihoods herding livestock on high-altitude grasslands face mounting threats from climate change. "Caterpillar fungus collection has emerged as a way for people in these areas to make relatively easy money," Hopping said, "and in some cases to really raise their standard of living." However, if demand continues to grow as supplies decrease, it could aggravate tensions over who has access to harvesting areas, Hopping said. "Communities in areas where it's still growing will need to remain vigilant about potential conflicts and poaching as people seek to harvest this increasingly rare and valuable species." Lambin is also the George and Setsuko Ishiyama Provostial Professor. Hopping is now an assistant professor at Boise State University College of Innovation and Design. Study co-author Stephen Chignell is now a PhD student at the University of British Columbia.